USD/JPY - "The Japanese Yen was a relatively strong performer last week in the foreign exchange market. Unfortunately the same cannot be said about economic data performance from home. Local retail sales and industrial production growth all slowed down. Then, Finance Minister Taro Aso noted that there is a “labor shortage” after the unemployment rate dipped to about a 25-year low. Next week brings a plethora of event risk for the Japanese Yen. At home, the final fourth quarter 2017 GDP readings are expected to rise from preliminary estimates. However, the top-tier one will be March’s Bank of Japan monetary policy announcement." Daily price is on strong bearish trend located far below Ichimoku cloud. - if the price breaks high last weekly bar at 107.67 to above so the secondary rally within the primary bearish trend will be started. "USD/JPY has now fallen to levels not seen since late 2016 before Dollar’s ‘Trump trade’ bounce, which came as markets got used to the shock election of the current US President. Moreover, there are few obvious signs that a turnaround is in sight." "The pair is certainly lower now that it was then, but it seems to be making a moderate attempt to base around the 105.40 area which has held for the past four days or so. 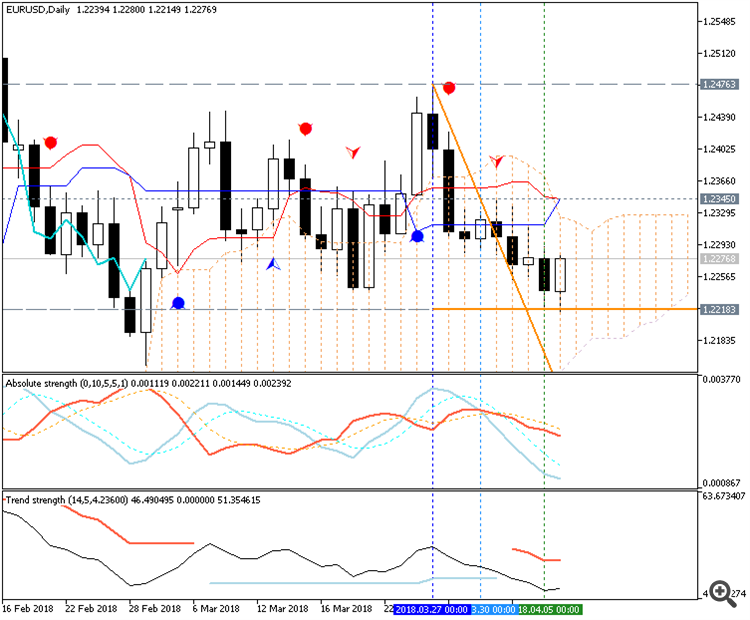 As you can see from the chart below this area is closer to the channel’s top than it is to its base." "Should these levels continue to hold then US Dollar bulls might fancy the chances of a foray towards than channel top. However, that’s still almost a full Yen above current levels and it’s hard to see where that sort of momentum will come from on current showing. There’s also likely to be a degree of fundamental caution this week thanks to the wait for Friday when official US payroll data will be released." 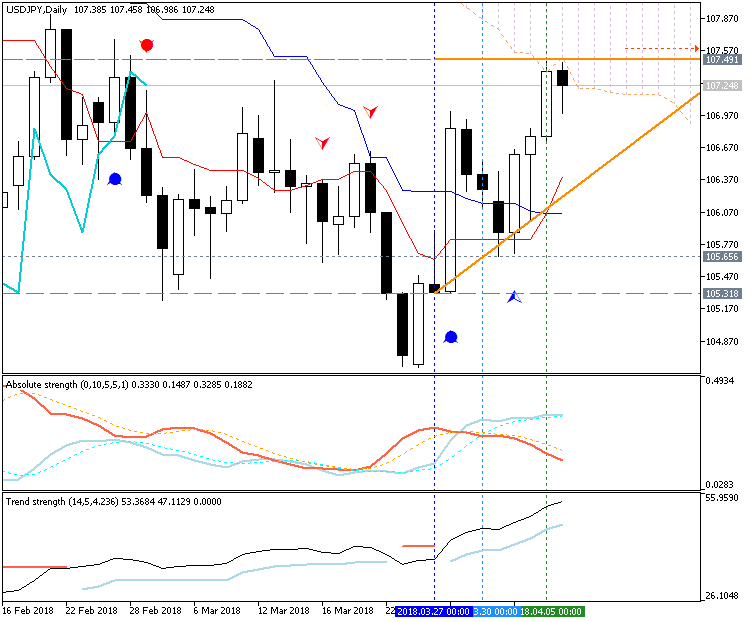 "After trading in a rather tight sideways range of a few hundred pips, USD/JPY may have found a volatility catalyst in the Moritomo scandal that has recently resurfaced. Nikkei News Asia said it best, and most succinctly when they said, “The revived scandal threatens Prime Minister Abe's grip on power. Either way, the USD/JPY downtrend remains entrenched below on closes below 107.095 (spot at 106.43), and institutions are looking for the broadening potential that USD/JPY could retest 100 if the scandal erupts. 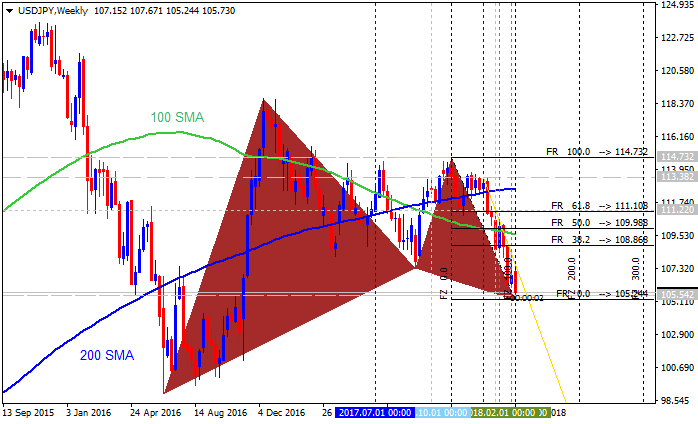 "The JPY has yet to break the March range of 105.25-107.20. However, news that Abe’s key minister, Aso will skip the G20 meeting and further developments on the Moritomo Gakuen, the educational foundation with supposed nationalist agenda could cause the monthly low to break. The break would likely happen quick if Abe’s political future based on his promise last February were likely to be exercised ending his bid to become Japan’s longest running Prime Minister." 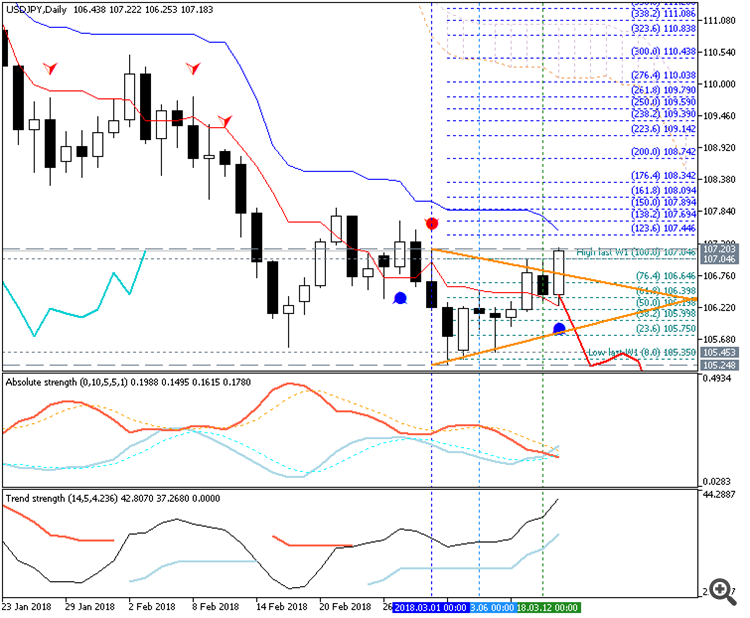 USD/JPY - "This past week was a volatile one with plenty of developments which saw stock markets fall and the anti-riskJapanese Yen emerge higher against its major peers. A relatively less hawkish FOMC monetary policy announcement on Wednesday fueled a US Dollar selloff across the aboard and the Yen benefited from it. But things really started heating up the following day. The week ahead will probably leave the Japanese Yen once again mostly vulnerable to external developments as opposed to domestic ones. To give an example, when Japan’s February CPI report crossed the wires at its highest since March 2017 last week, the currency failed to offer a meaningful reaction even though prices moved steadily towards the Bank of Japan’s inflation target." 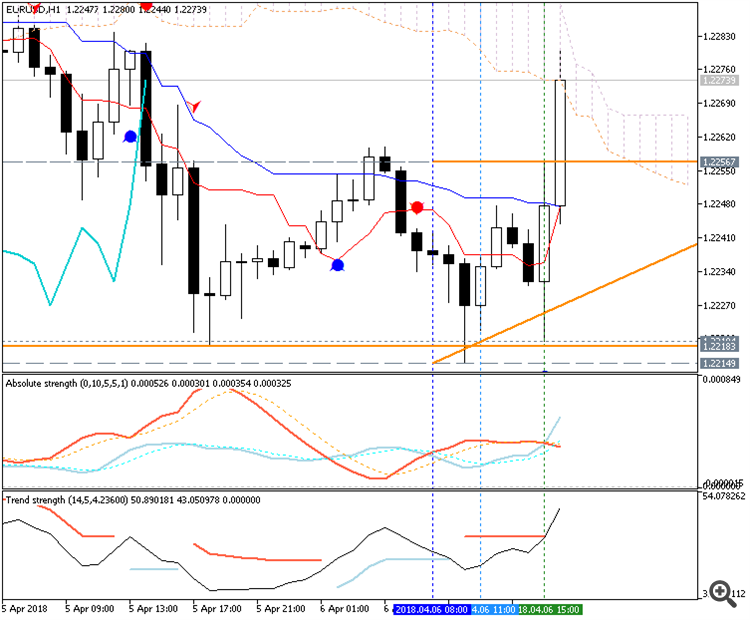 The chart was made on Metatrader 5 using HWAFM tool pattern tool from this post. "Total nonfarm payroll employment edged up by 103,000 in March, and the unemployment rate was unchanged at 4.1 percent, the U.S. Bureau of Labor Statistics reported today. Employment increased in manufacturing, health care, and mining." 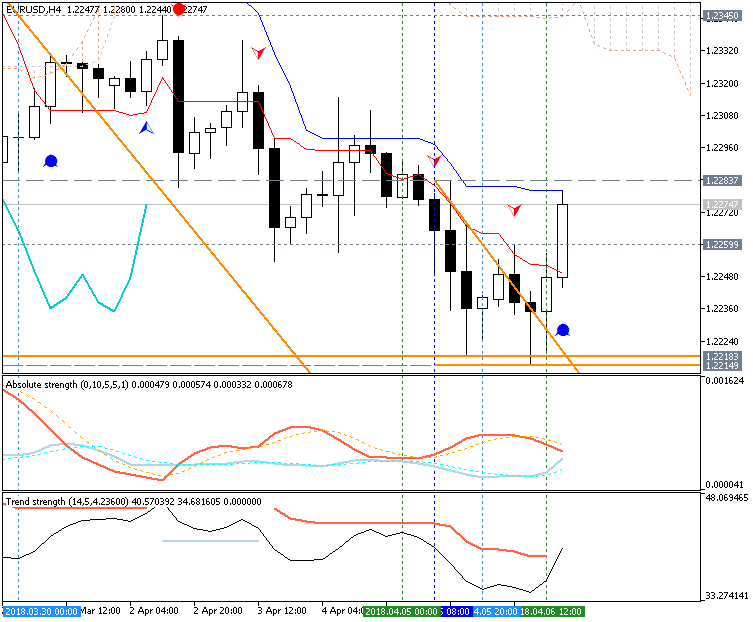 Does NFP has started change the course? 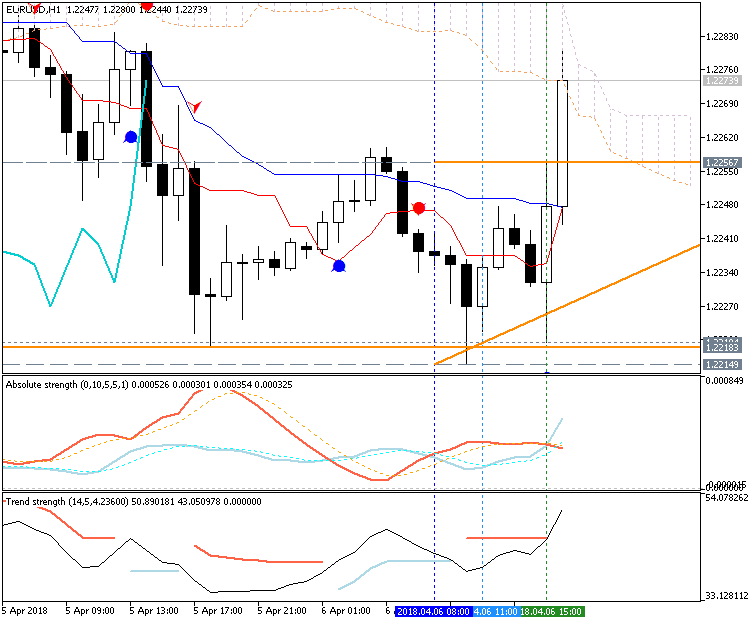 Are you talking about EUR/USD? 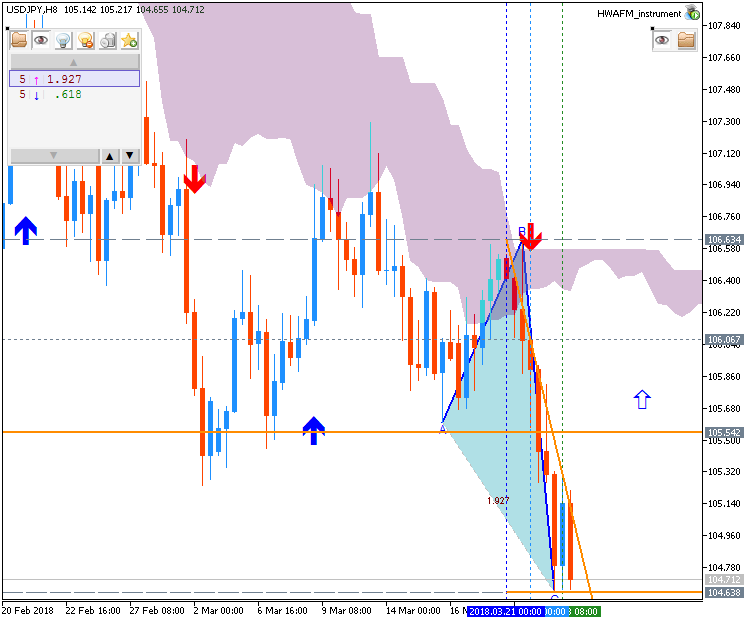 The direction based on the news events (to change or not to change) is estimated in the end of the trading day. So, it is too early to say about anything (if we are about H4,and D1 timeframes for example). 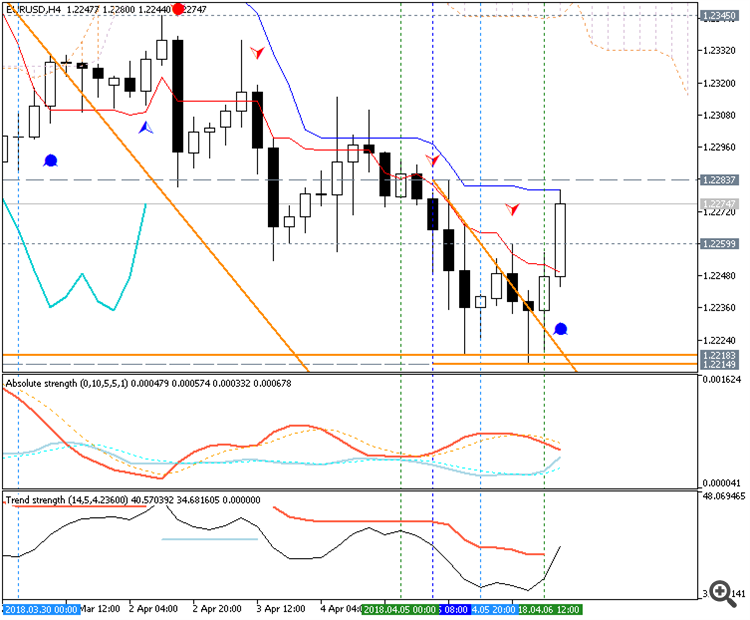 If the price breaks 1.2283 to above on H4 close bar so the secondary rally (without the primary bearish trend) may be started. 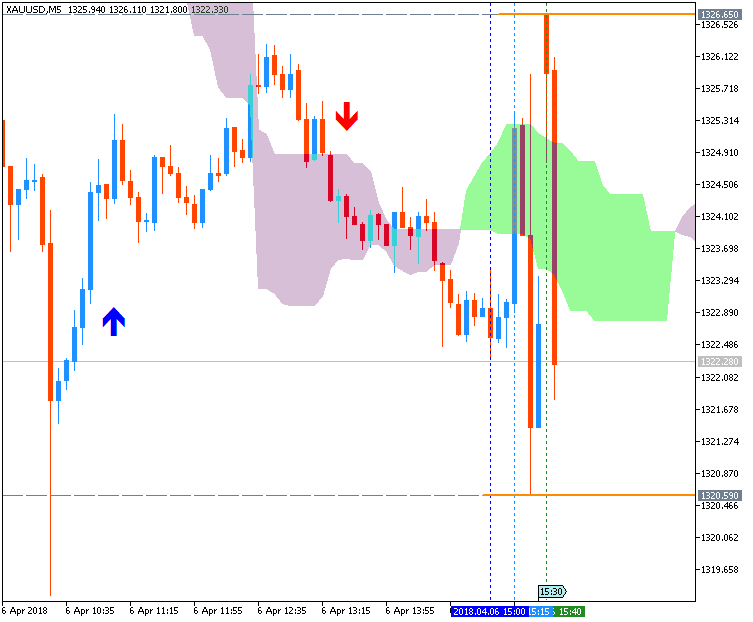 For H1 timeframe: the breakout is going on; on open bar for now. We need to wait when the bar is closed and new bar will be opened just to be sure about this breakout. 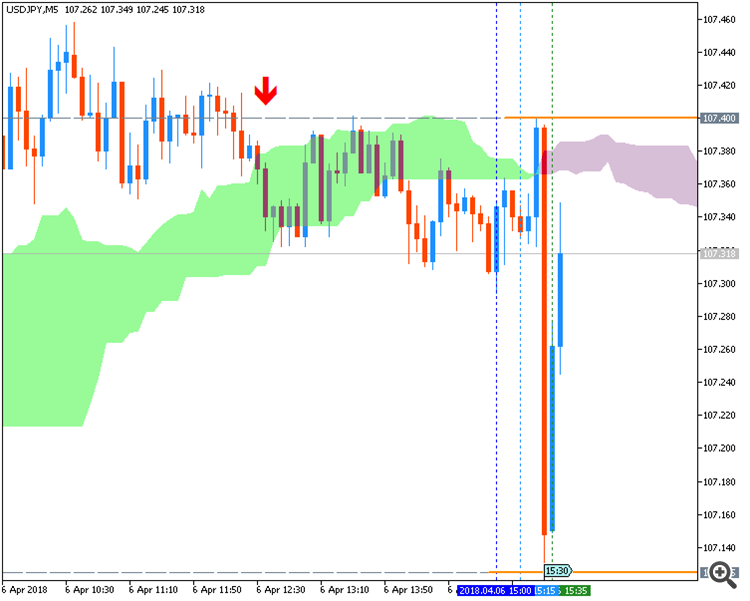 If price breaks Ichimoku cloud to above so it means - the reversal of the H1 price movement to the bullish market condition. So, the end of the day/session is the time to evaluate the trend/changes related to the high impacted news events. 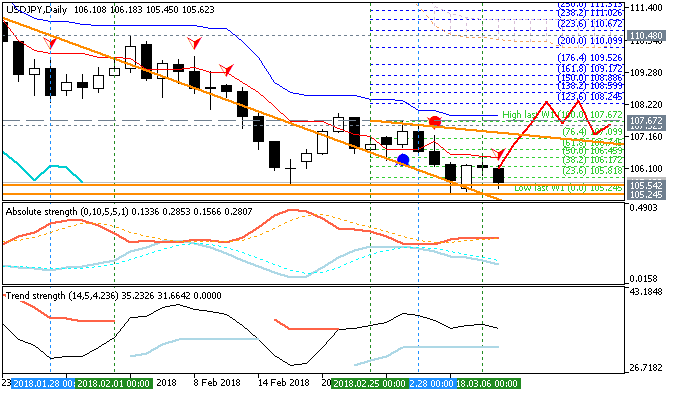 As to USD/JPY so the daily price is testing the resistance at 107.49 to above, and this resistance level is located near (near and above) Senkou Span line which is the border of Ichimoku cloud and the virtual border between the primary bearish and the primary bullish trend on the chart. 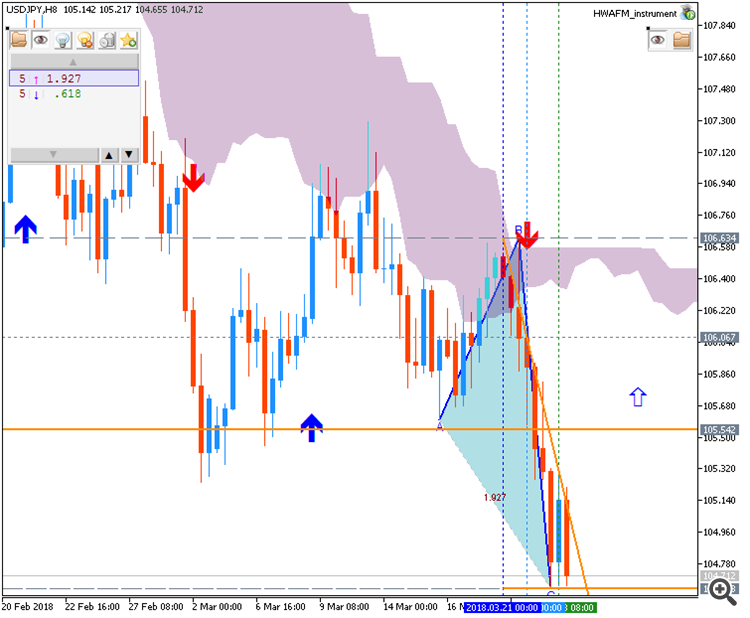 It means: if the price breaks this 107.49 on D1 close bar - the daily bullish reversal will be started.